Good morning to all of you optical illusion fans, and welcome to Tuesday morning! Hope you all are well, and getting up to face another work day. However, before you go, we have a cool optical illusion to share with you all. What do you all think of a knight all in black, would you say that was a good knight or a bad night? Well think about it while you check out today’s optical illusion, which is all about a black knight made of black ink! Do you all see it in the glass of water? 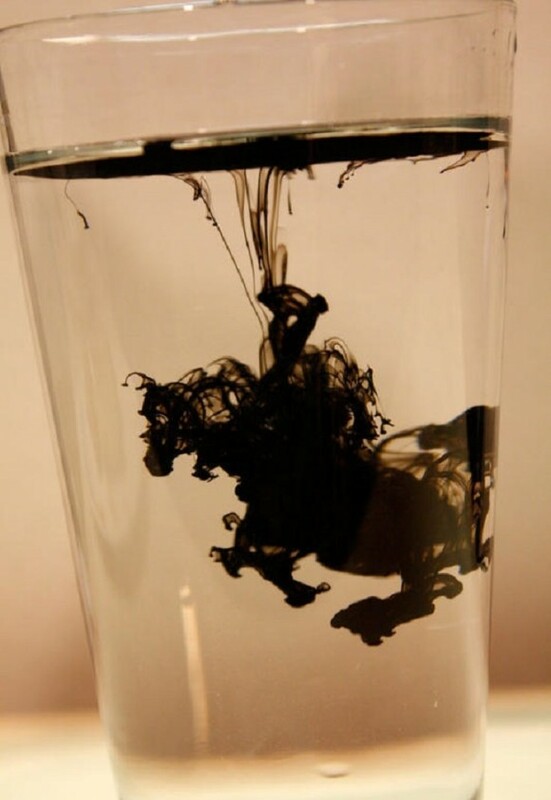 It is amazing what a few drops of ink can do in a glass of water, but you have to admit, it does look like a knight riding a horse. Want to see another great body paint optical illusion? Now, this may look like a flamingo, but it is really a person painted up to look like one, but it is still so cool! It is really hard to tell that this is not a real flamingo, which says a lot about the artist that created it. What do you all think of this great body paint work of art? Well, leave us a comment below and let us know what you think! Have a great Tuesday everyone! Some knight-it’s more like Don Quixote.